Last spring break I woke up with an unexpected note under my door. In a whirl of anticipation I learned that I had won the Silver award in the Golden Key Music Festival for piano and voice, with the prize being a performance at Carnegie Hall. Right then, the nerves began to set in. Having never sung in front of an audience I did not know what to expect. I dreaded ruining the performance and letting down my teacher, my parents, the entire audience, and especially myself. The day of the performance, my roommate, Lindy, surprised me with her entire family coming all the way to NYC to see me. Suddenly it was time to sing. I focused on a spot on the back wall. Slightly below where I was looking, Lindy’s familiar face popped out. I imagined I was simply talking to her on a typical night in our room. 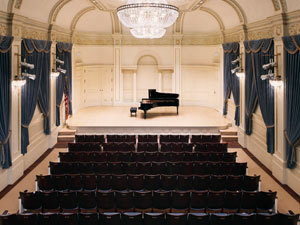 At the same time, my awareness floated out to include the vast Carnegie Hall audience. A new surge of energy rose out of my chest. In that moment, I realized that it did not matter where I was or who was watching. There was no reason to be nervous because I had made the decision to perform with my heart. I knew I was prepared after studying the music, the meaning of the words, the beauty of each phrase, and the soaring melodies. My singing left me vulnerable, but as I shared my soul, I was unafraid. This entry was posted in Visual and Performing Arts and tagged Dance, independent study, singing, westtown school on October 14, 2013 by ispring23.